Ernie Pyle was a journalist for the Scripps-Howard newspaper chain. Long before the term “embedded journalist” entered the national consciousness, Pyle traveled with servicemen, writing about the war from their perspective. He had a conversational writing style, and attracted a huge following during World War II. He won the Pulitzer Prize in 1944 for his work as a war correspondent. He was killed in combat in 1945. 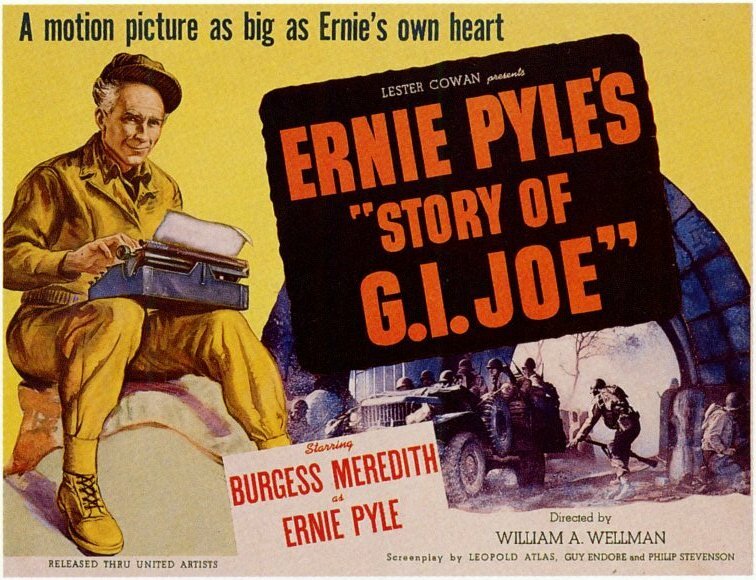 William A. Wellman’s film Ernie Pyle’s “Story of G.I. Joe” stars Burgess Meredith as Pyle, and co-stars Robert Mitchum as Lt. (later Capt.) Bill Walker and Freddie Steele as Sgt. Steve Warnicki. Gen. Dwight D. Eisenhower said it was the finest war film he had ever seen, and I tend to agree with him. Wellman is a superior craftsman. Not only is The Story of G.I. Joe one of the best war movies I’ve seen, its gripping scenes of combat have yet to be improved upon. For all the credit that Saving Private Ryan (1998) got for ushering in a new era of realism to the World War II film, watching this film reminded me that the horrors of war don’t necessarily need to be depicted in gruesome detail to be affecting. The first combat scene comes early in the film, when a German plane attacks the company on the ground, strafing them as they return fire with mounted machine guns and BARs. After the dust has cleared, there’s a low-angle shot of the men looking down, dejected and stunned, followed by Walker brusquely saying, “All right men, in the truck. Come on, make it snappy, the medics’ll take care of him.” As the men disperse, he says to Pyle, “First death’s always the worst.” The corpse is never even shown on the screen, but the impact is huge. The battle scenes in the film are gripping. Walker and his men fight amidst bombed-out rubble, in close quarters, in the destroyed towns and cities of Italy. But the focus of the film is on the day-to-day lives of the men in the infantry. For most of the film, Warnicki carries a phonograph recording of his baby boy’s voice that he received in the mail, but he can’t ever seem to find a record player. The living conditions of infantrymen are unglamorous. The men are nearly always unshaven, wet, filthy, tired, and underfed. Mud, rain, and fatigue are a few of the running themes. Pvt. Robert “Wingless” Murphy (played by Jack Reilly) is constantly falling asleep on his feet. His sleepiness provides a few comic moments, but not without some sadness. When he marries a WAC and they go the “bridal suite” (a truck), he passes out immediately. Meredith is the first actor billed, and a large part of the film is about Pyle’s relationship with the men he writes about. When a G.I. asks Pyle his age, he says, “Forty-three,” and crosses himself. The G.I. responds, “I’m twenty-six. If I knew I’d live to be forty-three, I wouldn’t have a worry in the world.” Pyle says, “Oh yes you would. You’d be just like me. Worrying about whether you’d get to be forty-four.” Meredith was actually 37 years old when he made this picture, but with his dyed white hair and bald pate, he looks older. He has a natural rapport with the men, but he doesn’t try too hard to be anyone’s buddy. In fact, in most scenes, he’s almost aloof. He’s also more soft-spoken than the real Pyle, who had a blunt, straightforward style, at least in the single piece of newsreel footage I’ve seen of him. I liked Mitchum in his supporting role in the 1944 film Thirty Seconds Over Tokyo (another excellent World War II film), but he’s even better here. The Story of G.I. Joe received four Oscar nominations, including one for Mitchum for best supporting actor. It was the only Academy Award nomination he would ever receive. He never won an Oscar. In The Story of G.I. Joe he displays effortless star power, even though the film is not a star vehicle for him. Director Wellman was a fighter pilot in World War I, where he earned the nickname “Wild Bill.” Like many pilots, he had no use for the infantry, and originally had no interest in making this film. Producer Lester Cowan went to great lengths to cajole Wellman into being his director, but Wellman only agreed to take on the job after meeting Pyle and spending time with him. An aura of tragedy and sadness pervades the film. Pyle acted as technical advisor on the film. The extras were all American combat veterans of the campaigns in North Africa, Sicily, and Italy. Most of them were in the process of being transferred from active duty in the war in Europe to the war in the Pacific. And many of them were killed fighting in Okinawa, the battle in which Pyle himself was killed. Posted in 1945, July 1945 and tagged Ann Ronell, Bill Murphy, Burgess Meredith, David Hall, Dwight D. Eisenhower, Ernie Pyle, Freddie Steele, Guy Endore, Jack Reilly, Jimmy Lloyd, Leopold Atlas, Lester Cowan, Lester Cowan Productions, Louis Applebaum, Otho Lovering, Philip Stevenson, Robert Mitchum, Russell Metty, Saving Private Ryan, The Story of G.I. Joe, United Artists, Wally Cassell, War Movies, William A. Wellman, World War II. Bookmark the permalink.